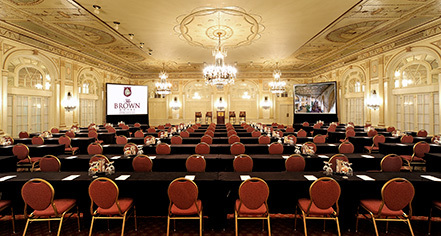 The Brown Hotel offers Louisville’s most exquisite meeting and event space. With 17 functional, flexible, and furnished event spaces to host from intimate groups of six up to 600 guests, the commitment to a flawless event is more than a promise. Whether for exclusive board meetings, product launches, or corporate-wide celebrations, the meeting rooms, private board rooms, suites, lounges, and the spectacular Crystal Ballroom can be customized to any celebration or function. The adjacent Brown Theatre offers an additional 14,000 square feet of function space, and is a memorable venue that can host up to 1,400 guests. Completely unique and charming, the 16-story roof garden venue reopened in 2016 for weddings, special functions, and private events. First opened in 1928 and last used in 1971, the 4,000 square feet of outdoor space overlooks the city from one of downtown’s tallest buildings. The heated roof garden can accommodate up to 400 guests. Gardens around the perimeter will include herbs, with copious fresh mint for the traditional Mint Julep. The Brown Hotel provides the most impressive and comprehensive event planning in Louisville, resulting in events long remembered for its unrivaled elegance and sophistication. All events are serviced by the professional staff whose meticulous attention to detail is second nature. A business center is available on site, offering personal computers, printers, fax, and copy services. 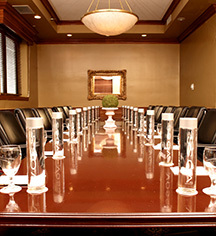 The Brown Hotel offers complimentary WiFi in all meeting rooms, and a complimentary 24-hour airport shuttle. Locally owned and operated, C & H Audio Visual Services, Inc. provides the Brown Hotel events with the highest quality audiovisual, lighting rentals, and production services. The company provides state-of-the-art audiovisual equipment to accommodate any need. With more than 100 years of audiovisual experience in the ever-changing event and meetings field, C & H is the trusted, on-site provider.